As a part of my European Voluntary Service placement, I designed a project that was linked to my work at Irkutsk based environmental NGO, Baikal Environmental Wave and applied for a small grant from the British Council’s Future Capital programme to realise it. I decided to create a Russian-Environmental road show and visit various places, such as University departments and community events to mention a few. This project is designed to offer insight and information to people and organisations, which may or may not have heard anything positive or recent about Siberia.It is also to provide an opportunity in an ever expanding and contracting global space to learn about one of the largest and most forgotten landmasses on the planet, and to provide possibilities for travel, contemplation and adventure there. 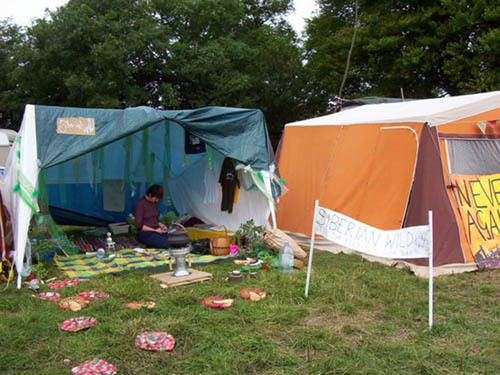 I kicked off my project in August 2005 at the Big Green Gathering, where I had a Campaigns Stall. The gathering was definitely a receptive starting place; filled with people active and involved in environmental, global and local projects who are positive and responsive to all attempts at bringing knowledge and peaceful suggestions for the initiation of change. So, with a hopeful heart, brave grin and my good friend Aisha, I arrived on site at the Mendip Hills near Cheddar Gorge ready to set up the pitch. If one has never had a stall anywhere, no matter how you think you can imagine all possibilities and potential problems, nothing can substitute real live experience. Enter Mickey-mouse gazebo and a raging storm on the first night.hmmm.. However, after a few major adjustments and some good rope from our kind neighbours we managed to prevent ourselves from flying off into the hills and could, with full confidence, create a welcoming space for interested people, which we filled with a photographic exhibition, maps and lay out the various leaflets we had. We also had Baikal Wave merchandi delightfully presented se on show, and a great display of Siberian teas and herb pillows from Sakhalin island, by Alexei and Kitty with info and ingredients. Response was actually quite overwhelming. The subject of Russia really fascinates many people, and when the word Siberia is used, responses are even more incredulous! When the weather was fine, which it was often, we had many rugs and blankets for people to sit on and were continually brewing up pots of Siberian herbal forest or flower. People from all walks of life came and drank tea with us and listened all about the threats to the incredible waterways and forests of Siberia, and were positive and responsive when informed about the opportunities to be volunteers with projects by Lake Baikal, for example. We talked of the link between the tea they were enjoying and the many reasons why forests left standing and living have more economic and eco-cultural significance than being felled and inefficiently made into paper. We also tried to point out that the relatively well-known issues affecting other countries in the world, such as the Amazon rainforest and irresponsible oil extraction in Nigeria, are problems which are being faced by Russia as well, but are much less known in the public and campaigning arena. We also tried to convey the important work being done by organisations in the fight against this merciless pillaging and their need for support, advice and help from those with experience to share and knowledge to offer. This initial venture really helped to consolidate my own ideas and aims, as well as reiterating the need for such ventures to play a part in the campaigning sphere of Great Britain. It also went miles towards reinforcing, (though there is no doubt as to the value in informing people about Russia), the relevance Russia has to the rest of the planet. Its local problems must be seen in the wider framework of the issues facing global sustainability, environmentalism and responsible ecological, economical and social development in our modern society. This entry was posted in Exhibitions, talks & films, Lake Baikal, Russia, Siberia and tagged Baikal Environmental Wave, Lake Baikal, Russia, Sakhalin island, Siberia. Bookmark the permalink.